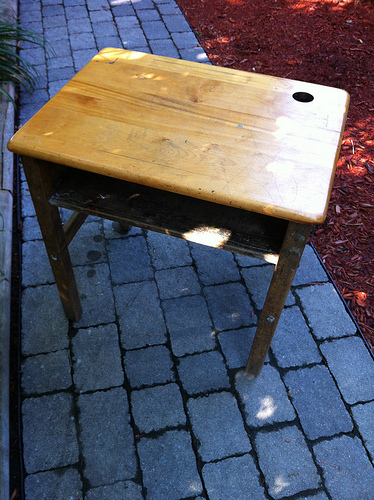 A few weeks back, one of the local schools was doing a clean out of their old stuff, and I found this amazing desk – free for the taking! The desk was pretty scratched up and covered with pencil scribbles. It had a wobbly leg too, but I had a vision for it. My daughter’s room doesn’t have a bedside table yet, and she has a ton of books that have no real “home.” Some days they make me a little crazy all piled up beside her bed. It seems as though as soon as I straighten up the pile it is calling for someone to read books and mess it up! 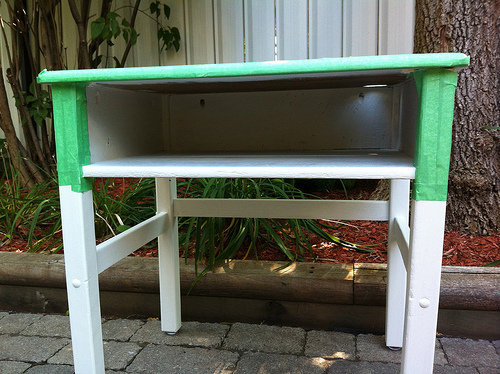 So, I was delighted to find this desk that could double as a bedside table, book shelf, and later become a homework spot too. 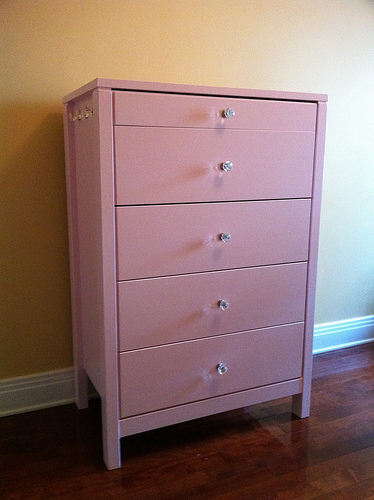 I decided to re-finish it to match the dresser I re-finished for her last summer. 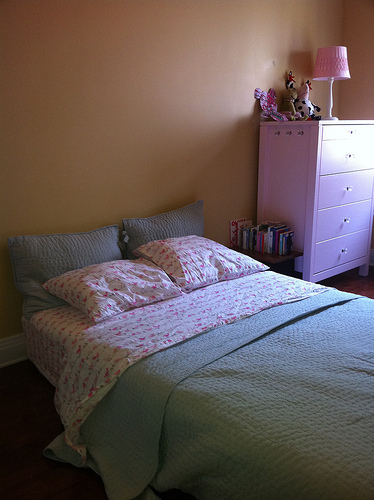 Her dresser is light pink with faux-crystal knobs, and her bed frame will eventually be white when she has one (for now, her mattress is on the floor until she is a little bit older). 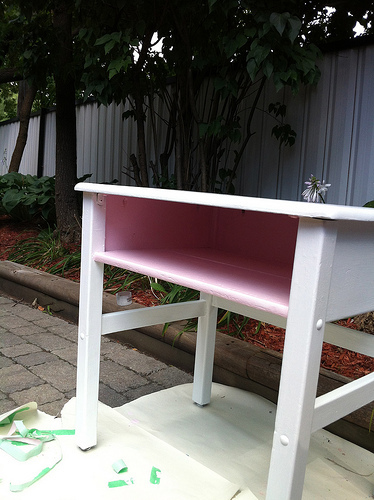 So I decided to make the desk white on the outside and pink in the “cubby”. 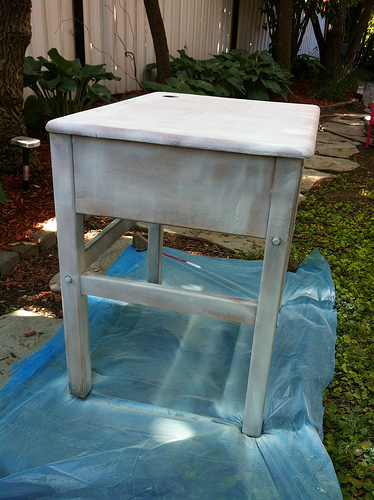 After two coats of primer, and three coats of white paint, the white was as crisp as I wanted. 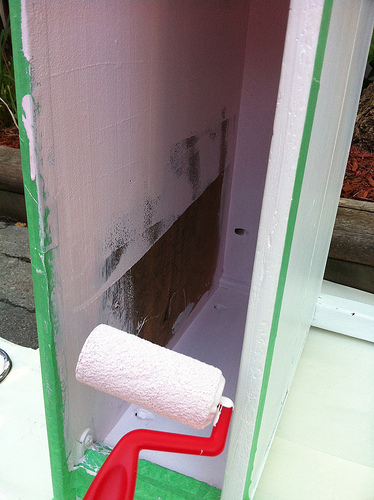 From there, I taped off the white and tackled the pink inside the cubby. This was a messy job since it was such a tight space. I found a little 2.5 inch trim roller in combination with a small brush for the edges and corners was the perfect combination of tools. 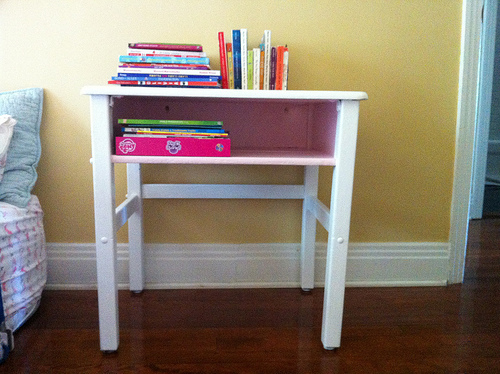 Two coats of pink, and light spray of varnish to the top of the desk and the project was complete! My daughter was really excited about her new piece of furniture and I too was happy to see all the books in their new home. Even better, the entire project cost less than $20. That suits my budget!